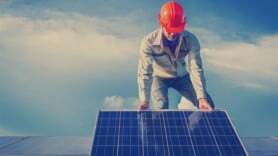 A solar farm being built in southern France, will become part of a much bigger array on the Puimichel plateau which combined will produce over 100MW by the end of the year. With an annual output of 26,000,000 kWH, Enfinity’s Les Mées project will provide 9,000 families with electricity each year and reduce CO2 emission by more than 9,200 tons annually. Belgian firm Enfinity have invested 70 million Euros in the 36-hectare site to install 18.2 MW of solar panels. Enfinity joins other firms on the vast site, which has been selected for its optimal solar conditions. The altitude of 800 metres ensures ideal ventilation and therefore offers 10-15% above average output.